scenario that forms our system's guiding metaphor. Exhibition shows are natural exchanges for vast quantities of information and their success relies on the quantity and quality of interaction of the involved parties: the exhibitors and the visitors. The more effective the interaction between end parties, the more successful the exhibition is considered. The mEXPRESS[i] research project aims to develop an integrated system consisting of software components, mobile terminals, wireless/mobile network infrastructure and indoor location positioning technology to introduce advanced B2C and B2E oriented electronic services through mobile devices. These technologies will be used to enable personalization, location-sensitivity, contextual-awareness and management of interaction in exhibition shows. The envisioned network infrastructure provides indoor wireless/mobile access through two alternatives: commercial Wireless LANs and Bluetooth. Indoor Location Positioning, which is necessary to support the context-aware services, is realized through a solution combining an indoor GPS system and a Bluetooth-based alternative. Software components will provide the personalized services, anonymous visitors’ monitoring, information and navigation facilities. Data-mining techniques will provide prediction of visitors’ trends and behaviour and the discovery of unknown patterns to both exhibitors and organizers regarding the traffic in front of each stand and in the exhibition. Finally, the results of the project will be verified through two pilot installations in exhibitions in Greece and Finland. Current business practices in the exhibition industry limit the interaction between the three principal actors (exhibition organisers, exhibitors and visitors) to the actual visit. The exhibition organizer contacts and invites the exhibitors in the respective exhibition. The visitors go to the exhibition and interact with the exhibitors at their stands, where they perform their promoting activities. The exhibition organizers also interact with the users as part of the facilitation and feedback process for organizing the exhibition. Thus, most of the pre-visit and post-visit interactions are fragmented and isolated, while all interactions are limited to synchronous request-response mode. · To enhance and facilitate visitors’ experience in terms of interaction and functionality in an information-rich environment, such as an exhibition show. · To improve business communications and promotions within the exhibition, as well as extend promotional effectiveness during and after the exhibition. · To assist and support the exhibition management and operations by offering real-time location information of persons within the exhibition. Whereas mEXPRESS targets visitors and exhibitors and exhibition organisers, emphasis is given on providing visitors with usable and value-added services, since their satisfaction generates benefits for the other two stakeholders; exhibitors and organisers. As a result, visitors are expected to gain the most visible benefit from the final outcome of this project. From an initial research in the exhibition industry, two types of exhibitions have been identified: B2C and B2B trade fairs. Moreover, exhibition shows are also distinguished from the sector in which they belong. The mEXPRESS project is not explicitly targeting a specific kind of exhibitions. However, in order to apply the mEXPRESS system in exhibitions it is expected that the target audience is up to a degree familiar with new technologies, such as kiosks, mobile services or positioning technologies. To meet its objectives, the mEXPRESS project has brought together a group of partners, who are expected to make their own contribution to both the development and the exploitation of the mEXPRESS results. The technology partners (INTRACOM, POULIADIS, L.M. Ericsson A/S, ELISA and SSF) use their technical experience on installing the network infrastructure and developing the mEXPRESS functional components, but also bring several important technologies, such as indoor GPS (SSF) and Bluetooth (L.M. Ericsson A/S), to the project. The users of the consortium (FINNEXPO and ROTA) provide their insight on how the exhibition industry operates as well as the needs and requirements of the targeted user groups. As soon as the mEXPRESS application is made available, they will provide access to their installations for testing and evaluating it. Finally, the research partners (RC-AUEB and HUT) bring their technical know-how and business background, but also provide their experience in international dissemination activities to promote the results of the project in both the research and business community. Two location-based systems relevant to mEXPRESS idea were tested over the past two years (2000 and 2001) in CeBIT, one of the world’s biggest computer fairs, taking place in Germany. Their target was to improve visitors’ experience and to provide more efficient promotion and analysis tools for exhibitors. The first system was called eGuide and was deployed in CeBIT 2000, while Mobile Fairguide, was deployed in CeBIT 2001.
eGuide  used infrared technology for communication between broadcast cell and hand held device and a data exchange format, specified in XML. eGuide provided a set of services for visitors such as find the way to the event, get information about the exhibits, plan a personal tour, organize appointments, navigate around the building, visit the right lectures or sessions. Also, additional information, like position of the cash-points or restaurants could be easily visualized. For exhibitors eGuide provided statistical functions (which topic of the booth was the point of interest or how many persons came by actually) and also advertising and news broadcasts. The exhibition organizers received useful statistical data regarding the number of visitors in a specific time interval as well as their location. The criticism of eGuide lies on the case of using infrared technology. This choice of technology in populated areas, influenced the quality of the communication, which is one of the major factors determining the visitor satisfaction level. Infrared requires direct line of sight to work properly and in populated areas is less likely that this criterion is met. The Mobile FairGuide  used Bluetooth technology both as a wireless communication system and as localization technology. “The Mobile Fairguide” offered three classes of services: standard Internet access, event-based asynchronous information indication using a WebTag mechanism (users received exhibitor information upon approaching the stands) and Ticker-tape broadcast service to all connected PDAs. Additionally, guiding services for finding the shortest path to a particular exhibitor in the hall, as well as information push services based on the selected user profile, were offered. For exhibitors and exhibition organizers useful tools for statistics, advertising and broadcasting purposes were provided. Trying to evaluate the services provided, the experimenters were able to show a working system under very harsh conditions. The location-based services were greatly appreciated by the customers, and the positive reaction made them optimistic that these services will find their way into the wireless Internet market rather quickly. On the negative side, it was found that the reconnect time after handover was far too long. It was measured up to 5 s due to the relatively complex enquiry mechanism of the Bluetooth radio. Faults in the base band software of the Bluetooth modules caused some system crashes. b2 Online Exhibition Platform (OEP). The b2 Online Exhibition Platform is a highly interactive business platform, designed to complement the physical exhibition. Its purpose is to connect the exhibition industry to a common platform where users can share resources and manage their leads and contacts. The tools enable exhibitors to reach out to the regional press as well as generate new leads, exchange namecards with potential clients, and schedule appointments to meet them during and even after the physical exhibition. b2 Online Exhibition Platform (OEP) is produced by DCS Solutions Ltd., Singapore. The Remote Access Mobile Point (RAMPTM) is a compact high-technology component that incorporates everything necessary to interact with handheld users on-location. It is simple for attendees with handheld units to receive beamed content and applications. Attendees do not need any additional equipment, options, add-ons or accessories. Information is updated on the RAMPTM wirelessly and then beamed directly to the attendee's handheld within seconds. Each RAMPTM can be customized and tailor-made for a trade show or an exhibitor to match colour or brand specifications. Remote Access Mobile PointsTM are provided in advance of a Trade Show for placement inside exhibitor's booths or Trade Show meeting areas. Streetbeam provides the tools to customize the content on the RAMPTM. Attendees enter a Trade Show, step up to a RAMPTM and instantly download material or information from the exhibitor. · Wireless/mobile in-exhibition access through the use of WLAN and Bluetooth technology. · Indoor, real time location-positioning mechanisms. · Service access through different terminal devices including mobile terminals (smart phones, PDAs), info-kiosks and standard PCs. · Personalised, context-aware services (e.g. navigation planning, on-route “bookmarking” of interesting material, provision of content for nearby exhibits, notifications). · Tools for statistical analysis of information regarding the visitors’ behaviour and interactions with the surrounding environment. · Content submission, management and description using XML definitions. · Integration schemes among the various platform components such as positioning mechanisms, networking technologies etc. The mEXPRESS Application Server. The application server will be responsible for the handling of user requests and the realization of the relevant application logic. Its main functionality includes: a) a front end to user requests, b) authenticating the users and imposing access control to subsequent user requests, thus providing a privilege-based access system, c) providing a set of user applications including appointment scheduling, navigation assistance, personalised recommendations, “bookmarking” capability, business cards exchange, and virtual communities application, d) adaptation of the applications’ output and multimedia content to terminal device capabilities (screen size, CPU, input method, etc.) and user preferences (e.g. language), e) continuous monitoring of mobile terminal locations, collaborating with location tracking modules, f) analysis of user behaviour and provision of useful information and statistical reports to exhibition organisers and exhibitors and g) provision of management tools to enable content submission and overall service management (e.g. definition of user roles and access rights). Wireless/Mobile Access Systems. Two wireless technologies (WLANs and Bluetooth) will be employed and tested to provide wireless access to visitors, exhibitors and exhibitor organizers within the exhibition boundaries. Both technologies will be used to provide interaction between the users and the mEXPRESS system, thus enabling “bookmarking” requests, business cards exchanges, and the reception of location relative multimedia content. Location Positioning Mechanisms. A number of positioning technologies are currently available . While outdoor positioning technologies are available for several years, many indoor positioning technologies are emerging . In our case, two different technologies will be used for the anonymous tracking of visitors within the exhibition area. · Bluetooth-based location positioning. In the simplest scenario, Bluetooth can provide information about the Bluetooth terminals existing in each Bluetooth cell. This mechanism provides terminal positioning information with a 10 meter approximation (the range of a Bluetooth cell). Further improvements of this mechanism will be examined, such as combining the signals from several Bluetooth access points, to provide better accuracy (1-2 meters). · Indoor GPS system. Taking into consideration the limited or no visibility of GPS satellite in indoor environments, an innovative indoor GPS solution will be employed. The provided solution includes a number of ground transmitters, pseudolites (pseudo-satellites), that will emulate the signal structure of GPS satellites and replace the GPS in the exhibition environment, a set of reference receivers that are used for signal integrity provision and synchronization of the pseudolites signals and the Master Control Station (MCS) running the control software for providing monitoring, configuration and control of the whole system. The receiver to be used will be a slightly modified GPS receiver, one capable of receiving the signal transmitted by the pseudolites. · PDAs. PDAs will be used by the visitors to make bookmark requests and receive multimedia content, notifications and routing information relative to their location. They will also be used by the exhibition organisers to receive notifications. · GSM/GPRS/UMTS mobile phones (or smart phones). The use of mobile phones as visitors’ access devices will be examined in mEXPRESS taking into consideration the capabilities of current GSM/GPRS and future UMTS technologies. · PCs/Laptops. PC and laptops will be used by the visitors for preparing the visit before the exhibition and for later review of the exhibition from the office. They will also be used by exhibitors and exhibition organizers to receive statistics, notifications and content submissions. · Info-kiosks. They will be used by visitors to review material collected, appointments and their virtual trail. The project has just ended the user requirements phase. This phase included the mapping of the current business model of the exhibition industry, the identification and capturing of user requirements and expectations for mEXPRESS and the definition of mEXPRESS application scenarios. The first results of this process are discussed in this section. 5.1 Mapping of the Exhibition Business Model. The research initially examined the Greek and Finish Exhibition markets. In the Greek market 35 organisers possess 70-80% of the market. The visitors are in the majority SMEs (owners or front line managers with buying power). The Exhibitors spend approximately 20-30% of their marketing budget for exhibitions. The Finish market includes 6-7 major and another 10 smaller organisers. The relevant expenditure account for about 6% of the exhibitors’ marketing costs. The latest data gathered regarding visitors’ profile reveal that 84% are men, 38% specialists and 18% managers while 76% of the visitors participate in decision making. The key players in the industry include: a) Exhibition Halls Owners, who provide physical infrastructure, b) Exhibition Organisers that provide the service infrastructure for efficient interaction between exhibitors and visitors, c) Exhibitors who use B2B & B2C events as effective marketing tools, d) Visitors, who receive the services of exhibitors and organisers, e) Sub-contractors, who provide support services to organisers (e.g. security, cleaning, electrical and electronic equipment, catering), f) Media Partners, providing media coverage of the event and publicity to organisers and exhibitors and g) Sponsors that provide funding and their brand name. The current trends identified in the exhibition industry include Visitor Orientation, the “Extended-Stay Visit” (employing traffic-flow engineering to achieve a desired pace), the “Experiential Exhibiting” (transform exhibit from a mere display to an interactive experience and the “Demonstration” (display of solutions, examples and use of new services or products). The method used for user-requirements capturing is called Contextual Inquiry and constitutes a combination of user observation and interviewing . The process took place at an exhibition in Greece (Thalassa 2002, 5-10 of April) and another one in Finland (Mobile Expo 2002, 16-18 of April). In Greece a total of 8 visitors and 9 exhibitors were observed and afterwards interviewed, while a similar number of visitors and exhibitors were used in the Finish case. During the observation phase the observers watched the normal routines of visitors and exhibitors in general, the visitor routes and exhibitor stands and interaction with the visitors. The observations were followed by interviews with visitors and exhibitors observed to verify the observation results. The set of tools used for data collection included an Introductory Visitor Questionnaire, a Stand Visit Observation Form, an Introductory Exhibitor Questionnaire, a Stand Observation Form and a Semi-Structured Interview Questions. Finally the process included interviews with the two organisers, participating in the mEXPRESS consortium, to identify their point of view. 5.3 An application scenario: “Wandering through the Exhibition Hall”. This section presents a representative application scenario regarding the use of mEXPRESS system. The visitor enters the exhibition centre and passes through the reception. The exhibition organizers ask for his invitation and the visitor informs them about his online pre-registration. The exhibition secretariat crosschecks the visitors’ data with the computer. After verification, the secretariat asks the visitor if he wishes to get a printed copy of the catalogue and a nametag or he prefers to use the mEXPRESS system (if he is aware of the system). If he is not aware, the organizers will inform him and then provide him with an access device. While he is about to enter the exhibition hall, he meets a colleague who is about to register onsite. The former visitor, who is assigned a leader and moderator of a group comprising of the company’s employees, is inviting the latter visitor to become member of the group. After that, the colleague gets his device as well, and they go on their different ways as they intend to visit different stands. Before splitting, they both ask to view on their devices a personalized and location aware navigation plan. Since our visitor wants to locate specific products he is using his device in order to locate on the map stands with the specific products (i.e. software products). After locating those stands on the navigation plan, he is taking the routing advice of his device to get there. As he approaches the stand of interest to him, he gets alerts for offerings based on his profile as well as targeted promotional spots of certain exhibits from the exhibitors. While wandering through the stands, the visitor gets recommendations for specific events as well as common announcements (i.e. the exhibition is about to close or the license plates of a car that is obstructing the parking area). Some of the events seem interesting to him but are taking place later in the day so he decides to go on. He is visiting 3 or 4 other stands that are in his list and he follows the exact same procedure with the previous ones. After being in the exhibition for 3 hours, he decides to take a break for a snack or coffee so he is moving towards the closest restaurant or rest area by using his navigation plan and routing advice on his device. On his way to the restaurant, he decides to meet with his colleague so he is using the system to track him since they both belong to the same user group. When he manages to position his colleague, he sends a real-time message asking him to meet in five minutes in the restaurant area. Before sitting in the restaurant, they get connected to the nearest kiosk in order to get information on their visit trail and movements up to this moment. Before leaving the exhibition centre, the visitor can get links to useful information for transportation means, traffic and other matters. After the exhibition, while being at home or in the office, the visitor gets connected to the system and downloads the material that he requested through bookmarks, as well as additional promotion material sent either by organisers or exhibitors. Furthermore, replying to the organisers’ request, he is using the system to send feedback by giving his response to an online questionnaire. The described system aims to exploit the technological opportunities arising from evolution in the areas of wireless networks and positioning mechanisms to support and facilitate the professional exhibition industry in a context-aware manner. By employing currently available mobile networks, emerging indoor location positioning technology and terminal devices, and providing a supportive mediation platform it will act as the hub between visitors, exhibitors and exhibition organizers/administrators before, during and after the exhibition. This will effectively enhance visiting experience and interactions among the involved parties, leading to a successful exhibition event. The mEXPRESS project officially began in January 2002. Till now, the mEXPRESS consortium has gathered user requirements and presented them in the form of Use Cases included in the project’s Requirements Specification Report. Based on User Requirements as well as several other requirements implied by technology and business framework of the project, a set of services has been defined for each user group. Moreover, the physical and logical architecture has already been designed and partners are currently working on the design of the system’s functional components. An initial prototype of the mEXPRESS platform is planned for delivery on February 2003. By that time, the consortium plans to have a clear view of its exploitation strategy for the project’s primary outcome. While the prime application field under investigation is the exhibition market where the exhibition organizers wish to offer to their customers (both visitors and exhibitors) innovative and differentiated services and administer the exhibition space more efficiently, we believe that several concepts and issues considered in the mEXPRESS project can be applied and extended to environments where context-aware information is of utmost importance, such as conferences , museums [8, 9], factories, libraries, and construction sites. In our emerging mobile world, where the environment and user needs change rapidly, the use of positioning mechanisms and technologies, which constitute the core innovation introduced by the project, may open the way for research in areas such as contextual behaviour and design, developing location-based services, and the use of the new location parameter in personalization and targeting mechanisms. Bierber, G. and Giersich M. (2001) Personal mobile navigation systems - design considerations and experiences, Computers and Graphics, 25, (4), pp. 563 –570. 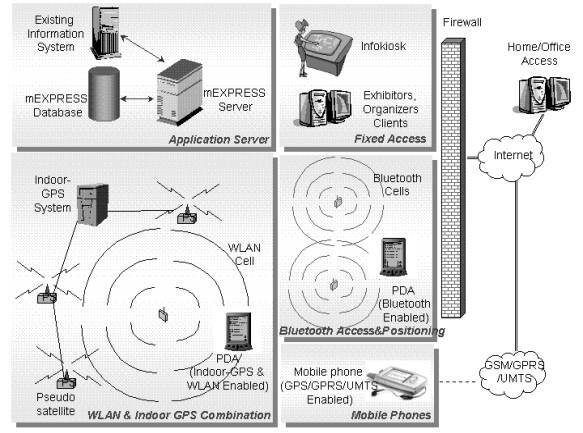 Kraemer, R. (2001) Bluetooth Based Wireless Internet Applications for Indoor Hot Spots: Experience of a Successful Experiment During CeBIT 2001. In the Proceedings of the 26th Annual IEEE Conference on Local Computer Networks, November 14 - 16, Tampa, USA. Dey, A.K., Salber, D., Futakawa, M. and Abowd, G.D. (1999) An Architecture to Support Context-Aware Applications. Technical Report GIT-GVU-99-23, Georgia Institute of Technology, College of Computing, June. Hightower, J., and Borrielo, G. (2001) Location Systems for Ubiquitous Computing, Computer, 34, (8), pp. 57-66. Giaglis, G., Pateli, A., Fouskas, K., Kourouthanassis, P. and Tsamakos A. (2002) On the Potential Use of Mobile Positioning Technologies in Indoor Environments. In the Proceedings of the 15th Bled Electronic Commerce Conference - e-Reality: Constructing the e-Economy, June 17-19, Bled, Slovenia. Beyer, H. and Holtzblatt, K. (1998) Contextual Design: Defining Customer Centered Systems, San Francisco, Morgan Kaufmann Publishers. Sumi, Y. and Mase, K. (2001) Digital Assistant for Supporting Conference Participants: An Attempt to Combine Mobile, Ubiquitous and Web Computing, In the Proceedings of Ubicomp 2001 - Ubiquitous Computing, Third International Conference, September 30 – October 2, Atlanta, Georgia, USA, pp. 156-175. Oppermann, S. and Specht, M. (1998) Adaptive Support for Mobile Museum Guide. In the Proceedings of the Interactive Applications on Mobile Computing Conference, November 24-25, Rostock, Germany. Oppermann, R. and Specht, M. (1999) A Nomadic Information System for Adaptive Exhibition Guidance. In the Proceedings of the International Conference on Hypermedia and Interactivity in Museums (ICHIM 99), September 23 - 25, Washington, USA, pp. 103 – 109. [i] This work has been performed in the framework of the IST project mEXPRESS (IST-2001-33432), which is funded in part by the European Commission. The Author(s) would like to acknowledge the contributions of his (their) colleagues from Intracom Hellenic Telecommunications and Electronics Industry S.A, L.M. Ericsson A/S, Elisa Communications Corporation, Pouliadis Associates Corporation, Space Systems Finland Ltd., Research Center of Athens University of Economics and Business, Helsinki University of Technology, The Finnish Fair Corporation, ROTA Ltd. The authors would like to acknowledge that they are solely responsible for this document and that it does not represent the opinion of the Commission, and that the Commission is not responsible for any use that might be made of data appearing therein.